Australian fruit Kakadu Plum is the key ingredient in Eviternity's new 20% Vitamin C & Hyaluronic Acid Age Defence Tropical Super Serum, which promises to reduce the appearance of fine lines, wrinkles, age spots and dull, tired looking skin. Also known as the Gubinge, Billygoat or Murunga fruit, Kakadu Plum is already popular in its native Australia as it contains a high concentration of vitamin C – in fact, 100 times more vitamin C than an orange. Vitamin C is known to reinforce cell antioxidant defences to better protect skin against oxidative stress. The Gallic acid in the Kakadu Plum also acts as an astringent against bacteria on the skin, whilst the fruit's extract of vitamin E can help reduce puffiness and dark circles under the eyes. What's more, Kakadu Plum extract can also effectively reduce the appearance of dark spots, improve skin discolouration and restore the skin's natural tone. Active ingredients from the Kakadu Plum are extracted to formulate Superox-C™, which stimulates SVCT-I, the skin's vitamin C transporter ensuring that vitamin C penetrates into the skin enhancing the skin's radiance. The formulation also includes Stay-C® 50, an in-vivo antioxidant and free radical scavenger which helps to improve skin tone and texture by reducing the appearance of skin blemishes and acne. It also stimulates the production of collagen and helps increase skin firmness. 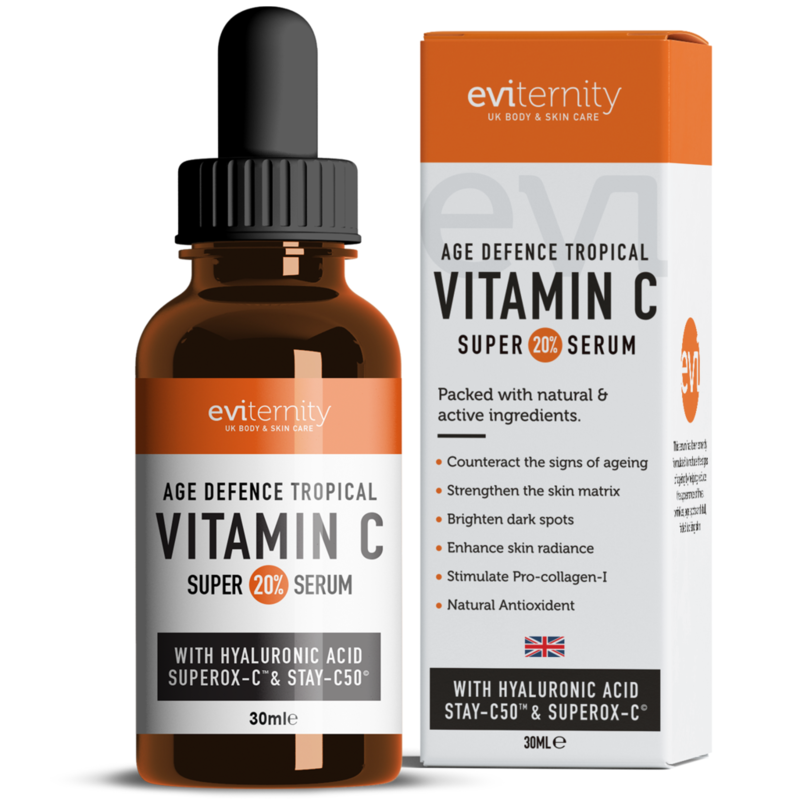 Eviternity 20% Vitamin C & Hyaluronic Acid Age Defence Tropical Super Serum is available in the UK online.